CANUN’s products include jackleg drills, stoper drills, sinker drills, screen pushers and quarry drills, as well as related parts and accessories. All original CANUN service parts are used to repair CANUN 260 and Boart S250 drills. CANUN is ISO 9000: 2008 registered and all service parts and drills are 100% inspected and tested in Val Caron to ensure they meet the highest levels of quality. CANUN supplies pneumatic drills, replacement parts and related products. The company has developed relationships based on its commitment to making drills that are durable and longer performing, as well as providing high quality and delivery standards that meet or exceed customer requirements. CANUN’s technical representatives and engineering staff offer consultation services on mining drill equipment and machinery. The company’s library of drill technical information is extensive and includes the Drill Doctors Handbook, a manual of established practices and practical suggestions for maintenance and repair of jackleg, stoper and sinker rock drills. CANUN also delivers training courses in drill repair and maintenance, so on-site staff can undertake work reducing costs and downtime. CANUN has a fully equipped facility to meet all customers’ repair and refurbishing needs, whether that is for a single drill repair or entire drill fleets needing a complete overhaul, CANUN will meet all customers’ requirements. As well as repairing CANUN 260B drills, the company also services all Boart S250 and Gardner Denver S83 rock drills. As part of CANUN’s commitment to manufacturing durable drills with a longer wear life, all CANUN products are made using the best material available and to the highest quality standards in the industry. Major components such as cylinders, backheads, frontheads, handle adapters and clevis body sections are made from high-grade forged steel. For parts that require heat treatment, methods are employed to produce the optimum combination of toughness and wear-resistance. Bronze materials are used for certain applications due the metal’s quality and strength, and CANUN manufactures specialised and oversize parts for specific applications, to extend the life of the high-cost components. 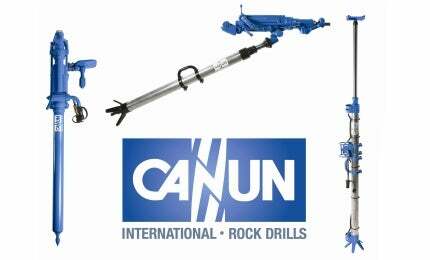 CANUN rock drills and service parts was founded in 1981 and has grown to be one of the major suppliers of equipment to the Western Hemisphere. This achievement and excellent reputation came from providing drills that increase production and lower operating costs. CANUN drills and parts are shipped worldwide to countries that include Canada, US and South America.